I have a very unique position here with Niagara's Watercooler in that I do what I can, when I can. Over the last couple of weeks, I have been so sick that I could not talk or really do much of anything else. I am one of those "lucky" people who can turn a regular cold into a bedside watch. I remember when Craig and I started the Watercooler, and then I had to take a backing role to his lead when my health just showed no signs of getting better. But in my capacity as unpredictable contributor, I get to sit back and watch the volumes of material Craig puts out. And I don't think many people realize just how much he puts into educating Lockport about itself. Recently, Craig Bacon wrote an article about the attention the monument down by the hospital was getting from the city during the Veterans Day celebrations. When I write something for the Watercooler, it is usually off the top of my head. I get an idea, I write it down, I edit it, then I put it out there for public consumption. But that article about the monument is a classic example of how Craig does things. That article took him well over a week to write, and I bet no one who read it even realized that. When Craig does something like the monument article, he has at least four sources he uses that he cross-references with other information he has. He spends hours every week at the library (I believe he is even on a first name basis with the homeless people who stay there), and he is one of the most respected sources for Lockport historical information in the country. He puts hours and hours into those articles, and he does it purely for the enjoyment of helping to educate Lockport residents about the city they live in. Craig is also a little excitable at times when it comes to local history. As you can see, he takes historical accuracy extremely seriously, and he has a personal vendetta against any person or organization that is relaxed about historical facts. This intensity has gotten him into a little trouble from time to time, and they are stories I always love to hear. It doesn't matter who you are, if you are wrong about Lockport history, Craig will publicly correct you. Why does he do that? He does it because it is all so extremely important him, which is something that is unique to see. When I have a question about local history, I just call Craig. I don't even bother looking to confirm what he says because I know he is right. When he gets into tussles online with others about historical accuracy, he is not trying to one-up anyone. I love the spotlight, Craig hates it. When he tries to set the record straight about some historical piece of information, he is doing it because he firmly believes that the only good information is accurate information. He will even spend a lot of time researching those "Reminiscing" columns you guys seem to love so much. What is my point? My point is that I read what he writes, I talk to him every day, and I work with him on something related to the Watercooler pretty much every day and I can see how much it all means to him. So when you guys read something that Craig writes in the Watercooler about local history, you should know that he does those things to make you understand your city better. It matters to him that you have the right information, and it matter so much that he is willing to make enemies of people who perpetuate bad historical information. It is a cliche that gets overused when websites say that they present only the best information for their readers. But the truth is that I don't think anyone will ever realize just how much Craig Bacon puts into his columns here on the Watercooler, and he does it only to educate the public. The guy has a passion for delivering information, and I hope you are all taking advantage of that passion and learning a little something every week. 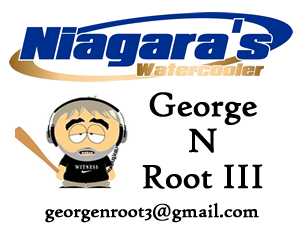 George N Root III is a Lockport resident and fan of Niagara's Watercooler. Follow him on Twitter @georgenroot3, or send him a message at georgenroot3@gmail.com.